I've always had a thing for makeup but I really fell in love when I realized that there was so much more to eye makeup than just throwing a shade or 2 on my eyelid... unblended. I practiced over and over and got better as time went on. Problem was that my eyeshadow always used to crease after a few hours. Extremely annoying! All that work you put into your eye makeup and at the end of the day you're left with a mess. I came to a point where I couldn't take it anymore so I went on a search to see what I could do about this. When I first found out about eyeshadow primers I was so happy to see that there was an answer to my problem. Oh, the woes of a makeup lover. So I went to Sephora, bought myself a bottle of Urban Decay Primer Potion, fell in love with it, and have been using it ever since. I couldn't believe that I was missing out on something so heavenly! A magical little product that creates a barrier between your eyelid and the eyeshadow. This barrier helps keep any oils from coming into contact with your eyeshadow which can cause creasing and fading. It also gives you a smooth surface to work with and grabs onto your makeup to keep it from sliding off throughout the day. In short, a primer will help keep your eye makeup vibrant and in place all day . Simply apply a thin, even, layer onto bare lids. Once it dries(which happens almost instantly), apply your eye makeup. 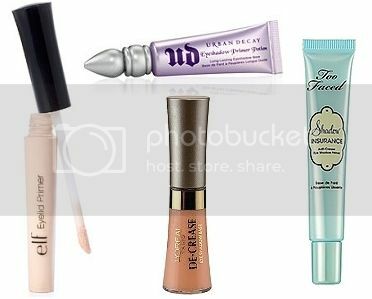 There are many eyeshadow primers to choose from but it's your decision on which works best for you. There are even tinted primers to help correct any eyelid discoloration. No matter what your price range, there is a primer out there. e.l.f. has eyeshadow primers starting at $1 and trust me just because something is inexpensive doesn't mean that it can't get the job done. Check out my e.l.f. Mineral Eyeshadow Primer vs. Urban Decay Primer Potion post! Check out my last Beauty101 post on how to clean your brushes here. Eyeshadow primers are a MUST for me and you will never forget the day you added them to your makeup stash! i don't have none of them. I would love to try the ud, but it's so expensive. The next elf order will be placed soon, so i will try the elf out next. For now i used the Revlon Eye primer & brightener..